He smelled of leather and sweat standing there in the middle of Kaufman Texas, the handsomest sixteen year old boy in town. Mike kicked his boot against the curb to crack the dried mud off the heel. He looked up at the marquee of the old Plaza movie house on Courthouse Square and squinted as he pulled the rim of his cowboy hat low over his honest blue eyes. Mike had only half an idea just how true those words were. He had no idea he was born in Los Angeles and had been adopted before he was one by his parents. They never told him he was Jewish or what his real name was. What he did know was that he was an outsider. 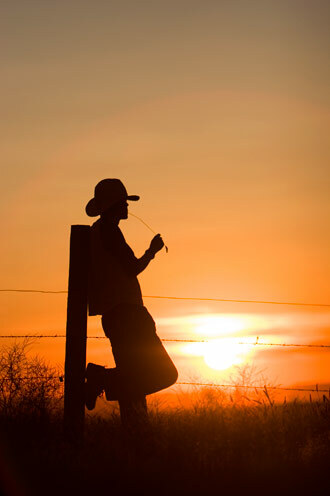 Even though he looked from top to bottom like Texas he longed for something beyond the rolling heat and big sky. It wasn’t something most people picked up about Mike, the girls at Kauffman High all had crushes on him. Most of the boys wanted to be like him. “You’re so pretty Mike.” One of the girls blurted out during lunch which in turn erupted in nervous laughter from his buddies. 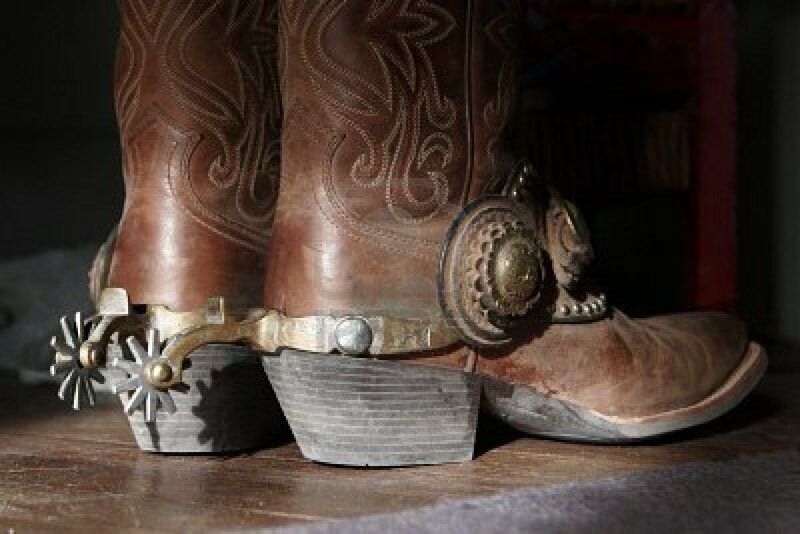 “There’s nothing pretty about me.” He barked in his Texas baritone. He was right, he wasn’t pretty. 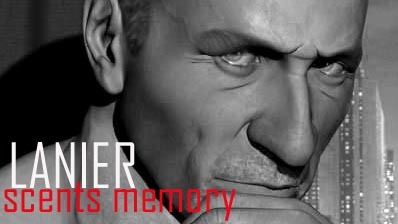 He was beautiful. It wasn’t his dirty blond curly hair, or his golden skin that shimmered smooth over his well muscled frame. Not that kind of beauty. He had a beauty deep inside that came from a natural valor and truth that bubbled up when ever he tried to hide his true essence. He was just too big for Texas. That night he sat in the empty Plaza movie house on Courthouse Square in the middle of Kauffman Texas and let Paris wash over him in the dark. That night he realized that someday he would fly away to a world where he could be real, to a world where he could kiss the boys and make them cry. 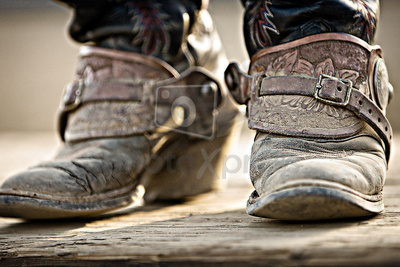 Even Cowboys from Texas can wear perfume. And not just any old perfume but one of the most beautiful leather perfumes around, Cuir de Lancôme by Lancôme of Paris. As I and so many others have said. Perfume is without gender and what is good for the gander works just as well on the goose. 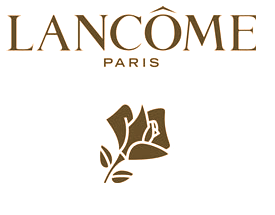 Cuir de Lancôme is from the La Collection Fragrance line by Lancôme. Their exclusive line created a few years back. Many houses now have special lines like Collection Privée by Dior and Les Exclusifs by Chanel. Lancôme has not been left behind in the dust on that account. This fragrance is most interesting in the fact that it is labeled Cuir (Leather) and yet it has not a single so called leather note in it. Yet its overall effect is that of the most luxurious fine leathers one can wear. It opens with a softly sweet and smooth mandarin orange and a slightly bitter bergamot that is given a tawny elegant smoothness with the addition of saffron. This note is where we get the leather. It is a grounded leather close to the earth and rather sensuous and caressing. This wonderful leather effect is created from a flower. Hawthorne lightly sweetens the mid notes and marries the jasmine and ylang ylang under a canopy of sturdy masculine patchouli. It really shines here. 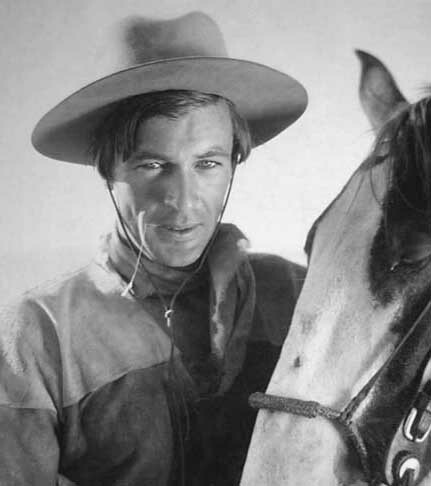 Never too loud like some leather perfumes, rather it is like a Gary Cooper cowboy in full control of any situation yet laid back and languorous with a hint of danger behind it. In the dry down it gets even more masculine with a balsamic styrax, the pure beautiful note of birch. These notes meet up with a austerely cool and gorgeous orris root. 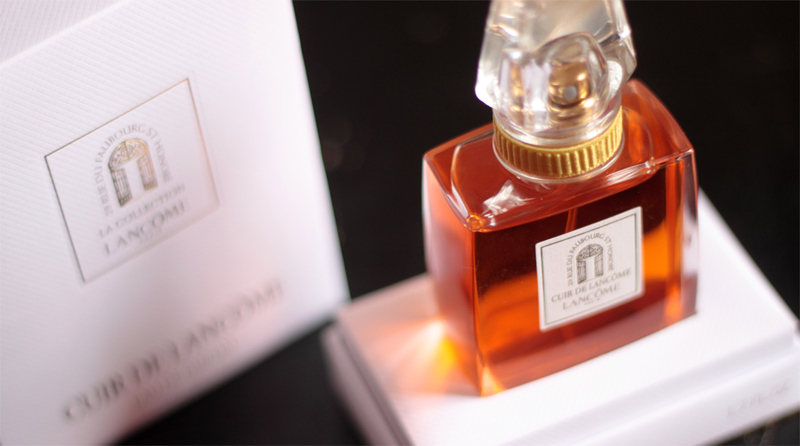 Cuir de Lancôme is never more beautiful than in its fading moments. With fall fast approaching I know that this will be in my rotation. It simply and effortlessly projects a quite, masculine elegance that with a flip of the coin is equally perfect on the skin of a woman of substantial glamour and poise. There are two noses behind this fragrance Calice Becker (J’adore and Velvet Orchid for Tom Ford) and Pauline Zanoni. Together they have come up with a really beautiful fragrance that lasts on my skin between 8 and 10 hours. Around the third hour it moves closer to the skin were it remains to invite more intimate exploration. The projection is moderate which I like in a leather fragrance. You don’t want to come in with six guns blazing all the time. Sometimes you can say much more leaning against the bar surveying the room from under a ten gallon hat. 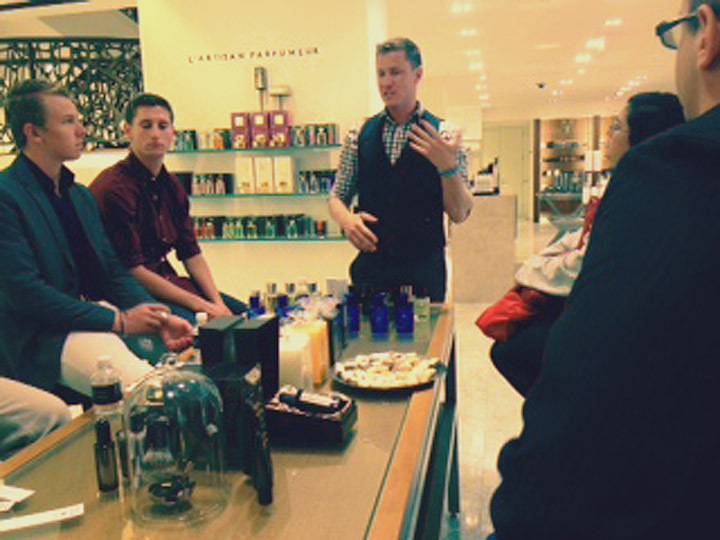 Last Thursday night I co-hosted the launch of Acqua di Parma at Barney’s NY here in San Francisco. I was invited by Michael Rogers the rep for the line at the exclusive department store to help set up the event and introduce him and the line to the Barney’s customers. Here is what I had to say about the Acqua di Parma that night. As far back as I can recall I have found a fascination with the lands that are kissed by the salty waves of the Mediterranean. The golden glamour of Egypt, the mystery that is Marrakesh, the fallen heroes of Hellas, and the place where God met man in so many different languages, but of all these lands one claimed my heart when I was very young. There in the middle sea stretching down from Europe toward Africa like an exquisite Ferragamo boot is Italy. Luchino Visconti swept across a Sicily now gone with the wind in “The Leopard” and Fellini gave us “8 ½” thousand ways to re-imagine our dreams, It all happened in the darkness of that old theater. A darkness that to me was brighter than sunflowers in Tuscany and as fragrant as Parma violets. and David Niven discovered the Perfume house of Acqua di Parma. They fell in love with unique beauty of the fragrance first created in 1916, Aqua di Parma Colonia. Think of it, 98 years ago. Hemmingway was driving an ambulance in the Alps, Paris was the last stop before Hell and the world was fighting for inches in trenches in the Great War to end all wars. Out of that terrible time came this beautiful fragrance and many more to follow. It survived World War I, this cologne fist created to scent newly sewn Italian suits and men’s handkerchiefs. The great depression didn’t diminish its beauty. And then it was liberated by the Allies on April 25, 1945 to a new world with a new look of glamour and sophistication. It became so interconnected with Old Hollywood that to this day it carries a cache of chic not many other houses can match. In one very real sense Acqua di Parma is Hollywood on the Tiber in a bottle. But it is much more than that to me. It is the smells of Italy. In each bottle from the Colonia of 1916 to the newest of the Blu Mediterranio it is there. The leather scented air of Florence, the Lemoncello nights of Positano. It is there in that little deco bottle. From the twisted juniper trees on high Sardinian cliffs to the rich gourmand blend of pasta and wine that is Rome. It is there. When I finally made my way to Rome, to see it for myself, to be immersed in my own dream, and to wake every morning and realize it was better than any movie, it was real. I smelled the trampled earth of the Circus Maximus after the rain, and a smoky incense swirl that meets the air when a church door opens, the flowers cut fresh at the foot of Giordano Bruno in the Campo di Fiori, and the shimmery slippery wet cobblestones of the via del Corso. Italy is fragrance, it is perfumed by history. These smells are the essence of Italy and as I breathed them in I knew at once that I had come home at last. Now it is your turn to find your story in the bottle, your turn to smell Italy and become a part of the dream. 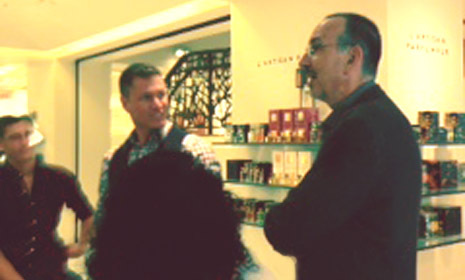 We had a nice turnout and everyone enjoyed Michael’s presentation of all of the fragrances of the line. He was so engaging and entertaining. I was so impressed by the time and effort he put in to the presentation. The table was beautiful and there were even samples of the ingredients for everyone to smell. Every aspect of Acqua di Parma is hand made. Even the beautiful boxes the fragrance come in. Of particular interest were the new Leather and Oud fragrances. At the end of the event every guest received a goodie bag packed with samples to try out at there leisure. It was so much fun to be a part of this wonderful launch and I want to thank Michael and Christina and the entire fragrance department staff who are always hospitable and wonderful. And welcome to Barney’s Acqua di Parma! If you are in the San Francisco area, do drop by Barney’s and say hello, smell some incredible fragrances and tell them I sent you.